Farmers are starting to re-emerge, supported by a restaurant scene that is wise to the benefits of a fresh local food system and a network of farmers’ markets. 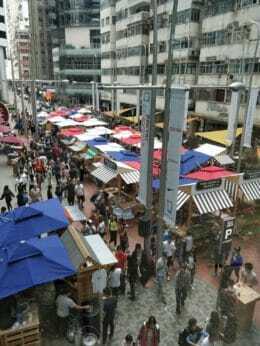 In many ways, the scene at Hong Kong’s Tong Chong Street Market on Sunday mornings is almost identical to the brazenly bourgeois gourmet food markets that are popping up around the world. There are half a dozen stands selling upscale espressos and cold brews, including Ralph’s Coffee by Ralph Lauren. There are prepared foods and natural wines. And there are food stalls that serve up black-truffle-infused spinach cream soup and banh mi sandwiches stuffed with foie gras. But there was something at this particular market that I had never seen before in nearly a dozen visits to this megacity: vendors selling fresh, organic vegetables grown locally. There were beautiful just-picked bunches of bok choy and romaine lettuce. There were small brown mushrooms, potatoes, rutabagas, Chinese cabbage and white radishes. Every vegetable had that undersized, flawless look I’ve come to expect when producers charge at least twice the average supermarket price. But they also had the look of painstakingly cultivated flavor — the kind of vegetables with the potential to steal the whole culinary show. Over the course of several days, I came to realize that Tong Chong is just one symbol of a surprising yet growing phenomenon in Hong Kong: the niche emergence of farm-to-table sensibilities in a place that imports over 90 percent of its food. Until the 1950s, almost all of the food consumed in Hong Kong was produced in the surrounding area. But rapid industrialization swallowed up much of the land available for agriculture and the workforce available for manual labor, and it soon became easier — and often cheaper — to import produce from China and the surrounding area. 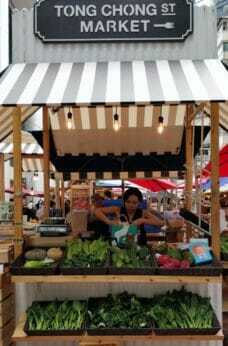 Now, slowly and on a smaller scale, farmers are starting to re-emerge in Hong Kong, supported by a restaurant scene that’s wise to the benefits of a fresh local food system, a network of farmers’ markets popping up across the city and a generation interested in food footprints and safety. Janice Leung founded Tong Chong (which started out under the name “Island East Markets”) in 2012. Her primary concern was environmental, but she finds that most of the Hongkongers who buy local, organic produce are concerned about the safety of produce imported from China amidst a series of scandals involving tainted products. Most of the farms are in the New Territories, the series of islands and parts of Kowloon attached to Mainland China that were claimed by the British in the late 19th century as part of a massive expansion. “I wanted to bring the farms to the people,” says Leung. There are now about 40 vendors at the market every Sunday morning, including three or four farmers’ stalls. Initially, Darling would get up early and drive out to the New Territories to bring back vegetables for his Italian American restaurants, which now include Posto Pubblico and Linguini Fini. But once they started displaying their bounties on restaurant counters and name-checking local farmers on their menus, customers would come in and ask to buy the produce, including kale, peppers, lemons and multiple varieties of tomatoes. “They would say ‘My kids never get cherry tomatoes at home,’” he says. While a small locavore movement is catching on with consumers, it’s been a tough sell to other restaurants. “Local, organic vegetables are twice the price, and in a place where property is so expensive, you look to cut corners anywhere you can,” says Darling. Since Hong Kong is perennially ranked as one of the world’s most expensive places to buy property, the high price of property also means that using agriculturally zoned land for farming can be much less cost-effective than sitting on it and hoping that developers will scoop it up. That might be why some of the newest initiatives in Hong Kong, such as Rooftop Republic, are transforming underutilized spaces like rooftops into green, mostly edible oases. Local farming initiatives are just one aspect of a more sustainable dining movement that’s taking hold in this megacity. On a recent night in Hong Kong, I stopped in at Grassroots Pantry, a fashionable plant-based restaurant, to attend a tribute to Vietnamese cuisine. Chef Peter Cuong Franklin, who was visiting from his restaurant, Anan Saigon, was casually ambling around the dining room with a glass of white wine in his hand. I sipped a funky biodynamic rosé and sampled hedgehog mushrooms fried in soy and accompanied by fresh herbs that he had grown and then carried in his luggage from Ho Chi Minh City. It’s encouraging to see the rise of locally grown food even in the city.